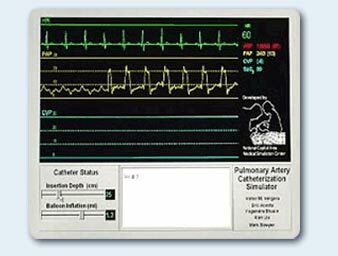 Pulmonary Artery Catheterization (PAC) is commonly used in a wide variety of seriously ill patients when hemodynamic and cardiac parameters must be accurately monitored. The catheter is typically inserted into a vein in the neck, passed through the heart and into the pulmonary artery. Transducer readings from the catheter tip provide a continuous report of local pressure readings, and an indication of catheter location. Competence in the use of PAC requires integration of technical skills, knowledge of potential complications and their prevention, and interpretation of the data obtained. Several studies in the medical literature have emphasized physicians and critical care nurses have a wide variability in their understanding of the use of the PAC. This has lead to calls for reevaluation of current teaching practices, and recommendations that granting of clinical privileges be based on cognitive and technical performance. We have developed a simulator for this procedure. It incorporates a novel visual language that permits clinicians to develop new cases for instruction. The visual language permits multiple complications and outcomes to be specified in the same case. Each event can be associated with a different probabilistic value. In this manner, students performing the case can encounter different variations each time it is performed. An interactive waveform editor allows actual pressure waveforms and EKG to be included as part of the new case. This video from a screen capture shows the change in pulmonary venous pressure as the simulated catheter passes from the right atrium to the right ventricle. This work is supported by the US Army Medical Research Acquisition Activity, Contract W23RYX-5159-N604. The views, opinions and/or findings contained in this report are those of the authors, and should not be construed as the official positions, policies, or decisions of the US Army unless so designated by other documentation. .